John moved to Toronto in 1932 along with his parents and two sisters and brother and continued his education at Norway Public School and Danforth Tech and after graduation in 1942, John joined the Royal Canadian Air Force and soon began his training as an air gunner. After graduation he was posted overseas to England where he became a member of the Bomber Crew as a rear gunner on Halifax and Lancaster Bombers. By December of 1944 John had completed a total of 58 operations and awarded the Distinguished Flying Cross. After his return to Canada in 1945 John completed his education and worked as an administrator for Metro Toronto Long Term Nursing Homes for seniors throughout the metro area. After his thirty-nine year employment with Metro John moved to Barrie, Ontario where he lived with his wife Margaret (deceased 2010) until 2012 when he moved to Langley, BC to be closer to family members. John is lovingly remembered by his eleven grandchildren, Melissa (Corey), Matthew John, Matthew Robert, David, Luke (Melissa), Lindsay (Shawn), Jenny, Jessica (Ben), John (Norma), Joshua (Latifah) and Lucas. John will be lovingly remembered by his sixteen great grandchildren and numerous dear family members and friends in Ontario (Toronto, Barrie, Cobourg) and BC. 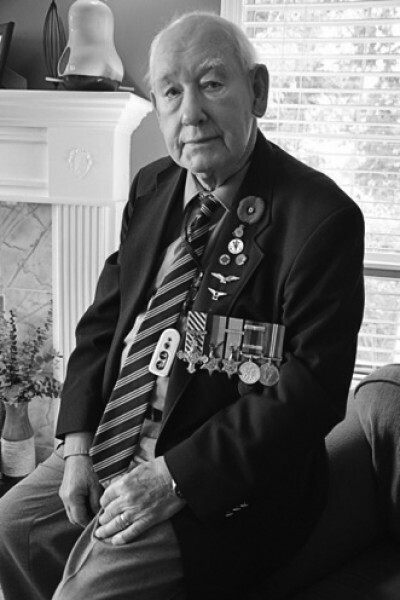 John was a member of the Legion (RCL) for many years in Toronto, Barrie and Aldergrove, BC Branch 265 also a past member and president of East York Kiwanis Club, Barrie Kiwanis and Probus Clubs and Veterans Clubs. A remembrance service to celebrate Johns wonderful life journey will be held at Henderson’s Funeral Home, Langley, BC on Friday, February 15th at 1:00 pm. If desired, a donation of your choice may be made to your favorite charity in John’s memory. Cremation has taken place and a short service of inurnment will take place at St. Paul’s cemetery, Barrie, Ontario at a later date.